This Rosemary Greyhound Cocktail is destined to become a new favorite. 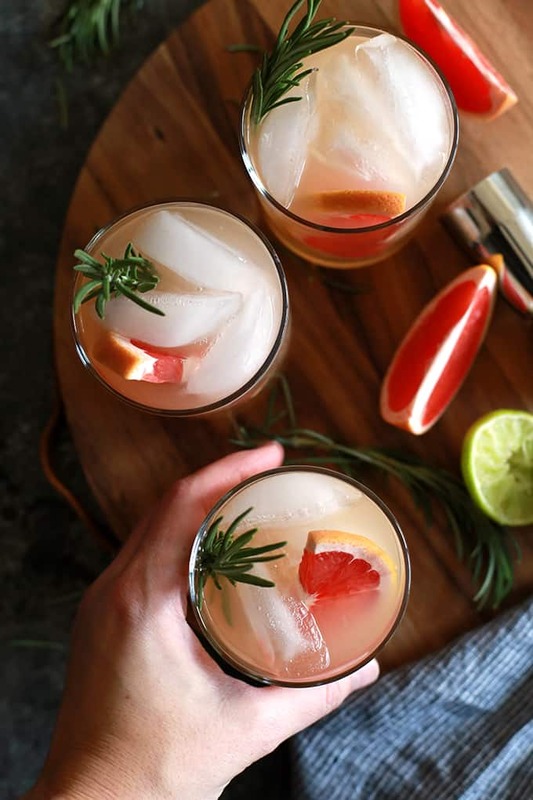 Grapefruit vodka, grapefruit juice, lime juice and rosemary simple syrup are shaken together, poured over ice and then garnished with fresh rosemary and grapefruit to create this bright and flavorful drink. After being married for over 15 years, one thing that’s become really obvious is that it’s hard to have couple friends. You know what I’m talking about. Where both you and your significant other are friends with both another couple. Where you can go out for dinner or another activity and everyone has a great time. When you find another couple like that, it’s like hitting a friendship goldmine. We totally hit the couple friends jackpot when we moved to Colorado with our friends Angie and Jay and our latest night out together was the inspiration behind my new favorite drink, this Rosemary Greyhound Cocktail. Although the locals think we have an amazing restaurant scene, I haven’t been anywhere that has made me want to make immediate plans to return. 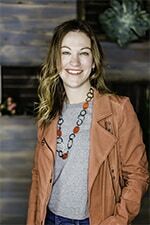 Knowing this, when Angie suggested we have dinner in a smaller nearby town, I wasn’t expecting anything out of this world but I was pleasantly surprised by the end of the evening. Especially after I had taken a peek at the cocktail menu and the ingredients of this Rosemary Greyhound Cocktail. 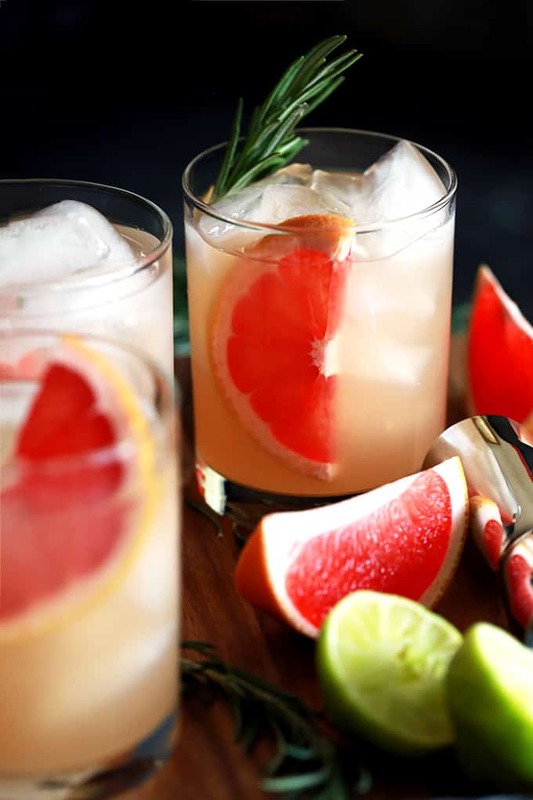 Listed on the restaurant’s drink menu as a Railcar, it touted grapefruit vodka, hand squeezed grapefruit juice and a housemade rosemary syrup as the key ingredients. 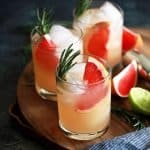 After a bit of mixology research, and more than a few Google searches, I learned that the drink should be more accurately named a Rosemary Greyhound Cocktail. 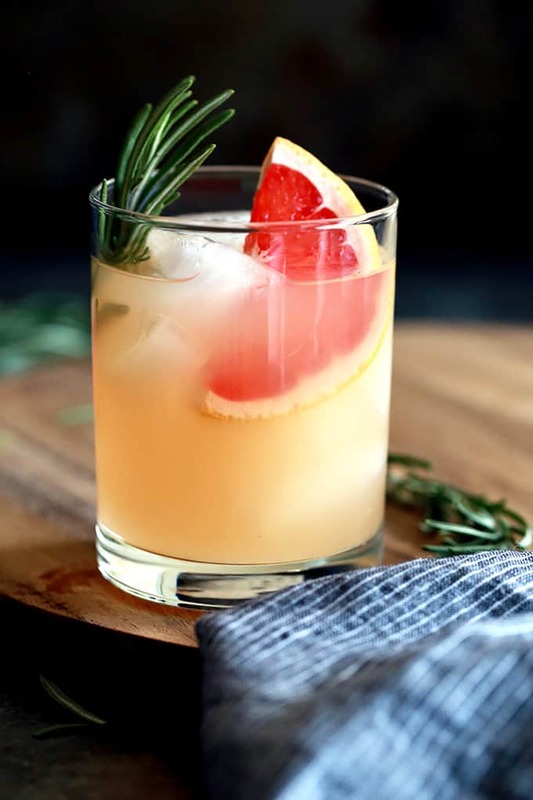 A traditional greyhound cocktail utilizes grapefruit juice and vodka but the addition of rosemary simple syrup truly makes this drink one of a kind. After enjoying two of these delicious drinks, our waitress was kind enough to get the recipe for me from the bartender when I requested it. That little slip of paper was stowed away in my kitchen until I finally had a few minutes to give it a try in my own kitchen over the Thanksgiving holiday. This isn’t my first foray into a grapefruit flavored cocktail. I become obsessed with these Grapefruit Mojitos earlier this year which then led to the creation of these Peach Prosecco Mojitos and Pineapple Mojitos. 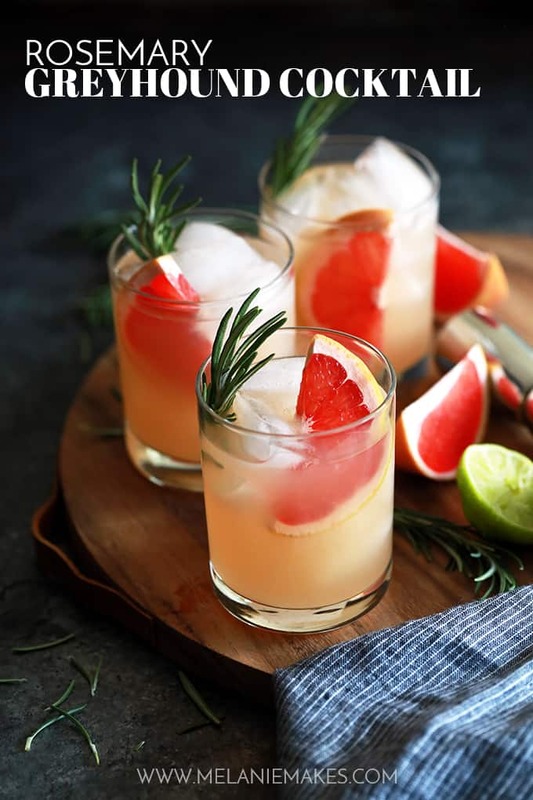 Grapefruit vodka, grapefruit juice, lime juice and rosemary simple syrup are shaken together, poured over ice and then garnished with fresh rosemary and grapefruit to create this bright and flavorful drink. 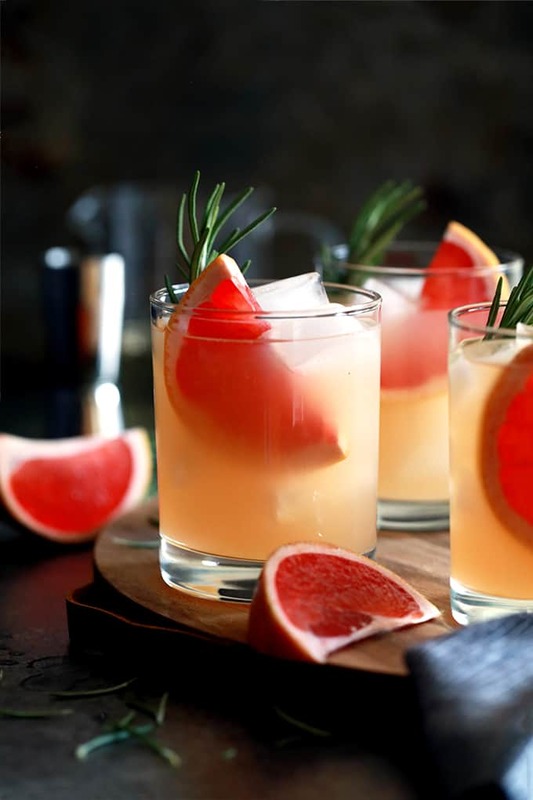 The pairing of fresh, in season grapefruit with the woodsy, evergreen scent of the fresh rosemary makes it the perfect drink to enjoy throughout the winter holiday months. Add sugar, water and rosemary sprigs to a medium saucepan over medium-high heat. Bring to a boil, stirring until sugar has completely dissolved. Remove from heat and allow to stand for 30 minutes. Pour syrup through strainer and into mason jar or other container that can become airtight. Cover and chill. Syrup may be stored in refrigerator up to 1 month. In a cocktail shaker filled with ice, add all ingredients. Pour over ice into glass. Garnish with fresh rosemary and a grapefruit slice, if desired. Looking to further expand your cocktail horizons? Check your bar for the ingredients needed to make this belly-warming Gold Rush Cocktail, party ready Island Breeze Cocktail and this one of a kind St. Germain Gin and Tonic Cocktail. Yummy! I love making cocktails in the evening around this time of the idea! It's definitely my new favorite, Catalina! So fun, fruity and festive! Definitely a show stopper for anybody hosting a holiday party. Gotta try these! These are SO stunning! Love the rosemary garnish too. You're so kind, Amanda - thank you! Wow, what a gorgeous drink! It sounds so light and refreshing which will be a nice change this time of year! Thanks, Jen! I love this flavor combination! Such a great party cocktail! Rosemary always add such a wonderful flavor! This is one GORGEOUS cocktail. I love grapefruit juice and know this must taste as good as it looks!! You're so kind, Liz - thank you for making my day!